Owen Ogletree enjoys a Belgian ale at the Globe pub in Athens, GA.
Having taught high school biology for the past 20 years, I’ve enjoyed traveling around the world during the beloved summertime. 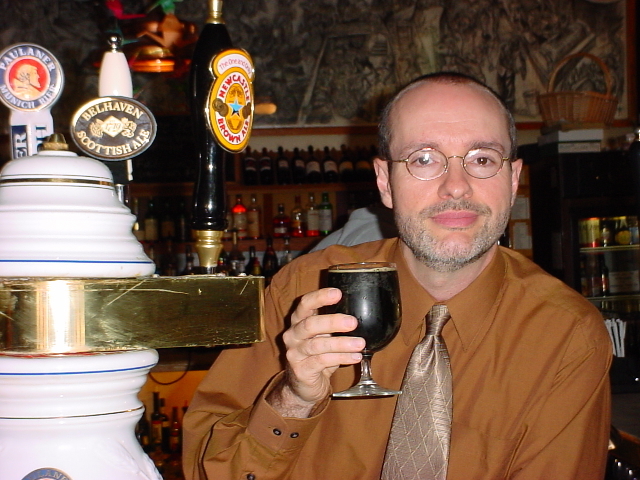 Sampling beers in bars, restaurants, and brewery tours in other countries sparked an interest in me regarding the history, production, and style descriptions of this remarkable beverage. In the late eighties I began to brew my own beer at home – with quite impressive results on occasion. I even owned a homebrewing shop called “Brewtopia” in Athens from 1995 to 1999. I was foolish enough to make a trek out to the Great American Beer Festival in Denver, Colorado in 1995 to experience almost 1500 craft beers made in breweries and brewpubs all across the 50 states. I came home to Athens and figured that our town could benefit from such a beer tasting, and thus was born the Classic City Brew Fest in 1996. Running a beer festival was much harder work than I ever imagined, but the event has prospered and will celebrate its tenth anniversary on April 16, 2005. Beer fascinates me. It is usually made from only four basic ingredients: water, malted barley (barley that is sprouted and then dried or roasted), hops (a spicy flower that grows on vines), and yeast. Subtle variations on these humble components produce almost 100 distinctly different styles of beer that are currently recognized by the Beer Judge Certification Program (BJCP). Most beer drinkers in America are content with restricting themselves to only yellow American Standard Lagers; but with all my tasting and study involved in becoming a BJCP National Beer Judge I appreciate the complexity and elegance of all the world’s beer styles. There are basically two types of beer: lagers and ales. Lagers are fermented at cooler temperatures using yeast cells that carry out most of their activity at the bottom of the fermentation vessel. Lagers are cold-conditioned for a period after primary fermentation, and this process creates a beer that is very clean in flavor with little fruity character. Being a lager has nothing to do with color -- lagers can be light to dark in color and low to high in alcohol. Ale is a more ancient style of beer that is fermented at warmer temperatures with yeasts that reside at the top of the fermenter. Ales have no period of cold storage and exhibit fruity complexity from the byproducts of the active yeast. Bohemian Pilsners are richer in malt and hops than standard American Lagers. They have a robust malt aroma and flavor combined with a spicy, floral hop character from the use of exquisite Saaz hops from the Czech Republic. Example: Pilsner Urquell. Cream Ales are like an American Lager made with an ale yeast. These refreshing ales are pale gold in color with interesting grain sweetness, balancing hop content, and hints of fruity complexity. Example: Terrapin Cream Ale. Strong English Bitter Ales have malt and caramel flavors that provide a pleasant counterpoint to the English hops that give a spicy flavor and wood-like bitterness. These smooth ales are often low in carbonation and have a medium body. Example: Fullers ESB. American Pale Ales range from pale golden to light amber in color and can be quite light, refreshing, and effervescent in mouthfeel. American hops stand out in these beers with a citrusy, pine resin aroma and flavor. Example: Sierra Nevada Pale Ale. India Pale Ales are much like normal Pale Ales with more malt and hops. In the 1800’s the extra hops acted as a preservative for the beer on the long trip from England to troops in India. IPAs have a pleasant, but intense hop aroma and bitterness. Example: Sweetwater IPA. Oktoberfest is a dark gold to ruby amber lager with distinctive, toasty maltiness from the use of rich German malts. The use of light, floral hops balances the malt and provides for a smooth brew that is usually made in the spring and enjoyed in the fall (especially at annual Oktoberfest celebrations). Example: Paulaner Oktoberfest. Doppelbocks are strong versions of malty German Bock lagers. Complex malt sweetness is in the foreground with floral hops in the background. Bock means “goat” in German, and these strong beers can have a kick like a goat. They range from gold to dark brown in color. Example: Ayinger Celebrator. Stouts and Porters are dark beers with grains that have been roasted to varying degrees from brown to black. This process imparts chocolate and coffee aromas and flavors that are quite appealing. Think of these beers as cold, bubbly espresso with alcohol. Examples: Young’s Oatmeal Stout and Samuel Smith Taddy Porter. Bavarian Wheat Beers are extremely refreshing wheat-based ales fermented with a special strain of yeast that provides a complex set of clove, vanilla, and banana aromas and flavors. Example: Schneider Weisse. Belgian Witbiers (commonly known as White Ales) are made with about 50% unmalted wheat and 50% pale barley malt. Their yeast, along with additions of coriander and orange peel, produces a remarkably fruity, tart, refreshing brew. Example: Hoegaarden Wit. Belgian Lambics are earthy, refreshing, complex, and usually sour ales that are fermented using wild microorganisms resident in the air around Brussels, Belgium. They are made with a portion of wheat and often have added fruits such as cherries (Kriek) or raspberries (Framboise). Example: Cantillon. Fruit Beers are best when made with generous portions of real fruit (not extracts). An outstanding fruit beer should have a color, aroma, and flavor that make the type of fruit used very obvious. The fruit should be in balance with the malt and hops, however. Example: Atlantic Brewing Company Blueberry Ale. Belgian Strong Ales exhibit layers of complexity from a variety of malts, hops, candy sugar, and unique yeast strains. These beers can be golden to dark brown in color and are fruity, spicy, and malty with a warming character from their high alcohol levels. Examples: Duvel and Chimay. Barleywines are ales made with such a huge amount of fermentable malt that they approach and often exceed the mouthfeel and alcohol strength of many red wines. English Barleywines accentuate malt, caramel, and toffee-like sweetness; while American Barleywines boast intense hop flavors and bitterness that dominate their malt sweetness. Enjoy these beers on a cold night in front of a roaring fire. Example: Flying Dog Horndog. Drinking only American Standard Lagers is like condemning yourself to eating nothing but white bread your whole life. Be bold! Purchase some beers from varying styles and have some friends over for a tasting. Order a sampler platter of all the house-made beers when you visit a brewpub. Beer can be just as complex and fascinating as any gourmet wine.